CTI Electronics gets green light from U.S. Navy to manufacture a military grade industrial pointing device to retrofit its fleet of Cruisers and Destroyers. In cooperation with Lockheed Martin, CTI is producing a NEMA 4X (IP66) sealed hand held Industrial Mouse in a stainless steel enclosure with an aluminum cradle for secured storage. 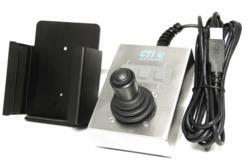 CTI Electronics has been supplying rugged computer peripheral and motion control devices to U.S. armed forces for over 20 years. Its commitment to long term product availability is only part of the reason for the selection of the Industrial Mouse pointing device. The ability to meet military specification standards, ensure high reliability and durability, within a tight budget was essential. Sequestration may have reduced budgets but it doesnt mean sacrificing on quality products that the men and women of the U.S. armed forces deserve. The Industrial Mouse is a high precision joystick that allows computer cursor control in harsh environments. It prevents liquid or debris ingress, operates in extreme temperature ranges, and protects against electromagnetic interference as well as radio frequency signals. The selected M20U9-N3 pointing device has a standard USB connection with three mouse buttons on the enclosure and a left mouse button on the joystick. The key design feature that solidified the selection of this hand held pointing device was its ease of use. The Industrial Mouse provided precision control of the mouse cursor with an instantaneous point-n-click button on the joystick. Speed and accuracy were paramount in the selection process by the military crew members. Secure and convenient storage of the pointing device was also a critical factor onboard the vessel. The aluminum cradle is mounted to a non-movable surface which securely holds the hand held pointing device with padded rubber gaskets. The design provides the operator with the freedom of usage either in or out of the cradle based upon the conditions at sea. Along with several industrial pointing device choices, CTI offers a number of manufacturing options to tailor a device to the requirements of the application. The modular design allows sub-assemblies to be interchanged; producing hundreds of possible combinations, while still maintaining a rapid order to delivery process. For those Original Equipment Manufacturers and Systems Integrators that require a custom human machine interface device, CTIs engineering and fabrication expertise can be contracted. CTI Electronics Corporation is a leading U.S. manufacturer of rugged industrial computer peripherals. Products range from keyboards, joysticks, trackballs, to switches used as operator input devices, mouse pointers, or motion control devices. Designed to operate in extreme temperature ranges (-40oC to +85oC) while under harsh conditions these devices offer a NEMA 4 (IP66) watertight sealing. The commercial off the shelf human machine interface solutions can be customized to the original equipment manufacturer or systems integrator build to print specifications. For additional information, visit http://www.ctielectronics.com or call 203-386-9779.